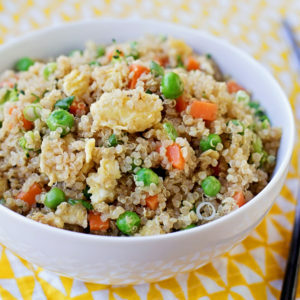 You've gotta try this Easy Quinoa “Fried Rice”- it's light, healthy and packed full of protein & veggies! Preheat a large skillet or wok to medium heat (I've used both a nonstick and a regular skillet, I kind of prefer a nonstick for this rice). Pour 1½ tbsp. of the oil into the pan. Once the oil is hot, add the lightly beaten eggs. Let them cook for about 30-40 seconds or until set, then scramble. Once the eggs are fully cooked, remove them. Add the remaining oil to the pan- when the oil is hot, add the garlic and peas and cook until the garlic is fragrant and translucent. Turn the heat up slightly and add the cold quinoa. Cook the the mixture for about 2 minutes, then add the eggs, broccoli, carrot and green onion. Pour the soy sauce, sesame oil and oyster sauce and stir until combined. Cook until the mixture is hot, serve immediately. -Chicken, pork or ham would make a great addition to this fried rice! Just the cooked meat along with the eggs and remaining vegetables.